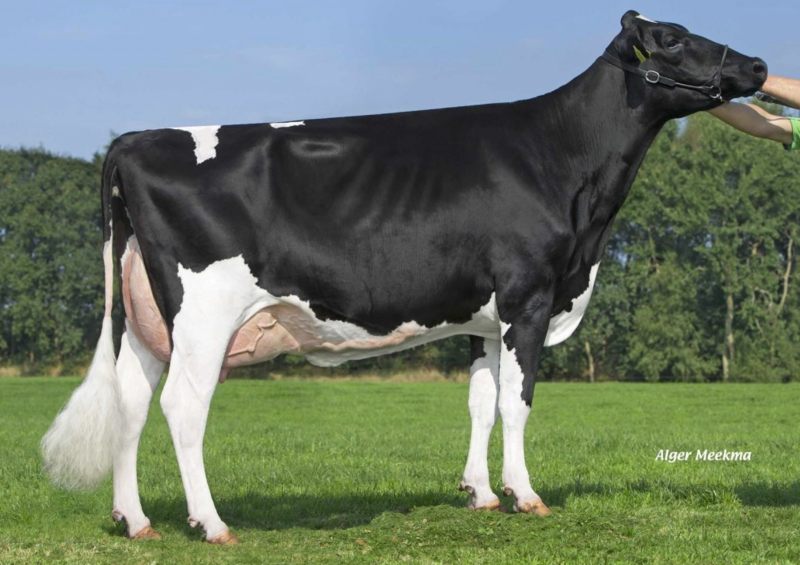 There is a new picture of NRP Alisha *RC, the Rubicon daughter which is recently scored with VG-85-NL 2yr. VG-86-MS. She traces back through the Supersire daughter ALH Australia VG-87-NL 3yr. back to the great KHW Goldwyn Aiko EX-91-USA, former #1 GTPI *RC cow in the world, which is the Goldwyn dtr of Kamps-Hollow Durham Altitude EX-95-USA! This family is worldwide known because of their ability to produce the best of the best females and males! How about the maternal sister of Goldwyn Aiko, the one and only KHW Regiment Apple-Red EX-96, which was Grand Champion of the World Dairy Expo in 2011! And it is the same family as the well known bulls like: Advent, Acme, Armani *RC, Jotan and Diamondback *RC! Check out the beautiful picture of NRP Alisha *RC VG-85-NL below and go to the Eurogenes Online Embryo sale to buy yourself a part of this great family!! * Unique Red Carrier cow out of the Aiko's! * Maternal sister to the former #1 & #2 GTPI R&W Heifers in Europe! * Dam of NRP Alisha *RC VG-85-NL 2yr! * Dam of the former #1 & #2 GTPI R&W heifers in Europe!! * FEMALE embryo available through the Eurogenes Online Embryo Sale by Bacon-Hill Montross! * Grand Champion World Dairy Expo 2011! * Red Impact cow of the year 2013! * One of the view $1,000,000 cows in the world! * Grand dam of the popular high PTAT bull Mr. D Apple Diamondback!